Launch your own heist on Amazon this week and get Steven Soderbergh's crime trilogy on Blu-ray for one hell of a steal! 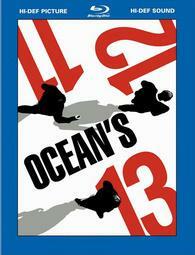 Amazon is selling 'Ocean's Eleven, Twelve, & Thirteen Gift Set' for $17.99 (50% off suggested list price). The star-studded cast includes George Clooney, Brad Pitt, Julia Roberts, Matt Damon, Al Pacino, Don Cheadle, Casey Affleck, and Catherine Zeta-Jones to name a few! This looks like this is the lowest this set has ever been, so click here to take advantage of this price drop while you can! The deal expires May 28.